The Western Front Association (WFA) was founded by John Giles and inaugurated on 11 November 1980. Initially there was one national ‘branch’ but as the number and geographic spread of members increased, the Association moved first to a regional structure and then to individual branches. Wessex Branch is one of 48 affiliated branches of the WFA in the UK. The Wessex Branch WFA is a registered charity and entirely self-supporting. It is not funded by the national WFA. The branch is dependent on donations and grants in order to meet its running costs and to achieve its constitutional objectives. Meetings are held at Pimperne Village Hall in the heart of rural Dorset. Pimperne village lies two miles north-east of t he Georgian Town of Blandford Forum with Blandford Camp, currently home of the Royal Signals, less than a mile away. The seaside resorts of Bournemouth, Poole and Weymouth are all less than 30 miles away as is the Cathedral City of Salisbury. Within an hour you can reach Southampton (to the east) or the historic city of Bath (to the west). Closer to Pimperne are the smaller rural towns of Dorchester, Shaftesbury, Sherborne and Wimborne. Since its formation in 2003 Wessex branch has gained a reputation for being active, friendly and effective in its activities. Wessex Branch offers a high quality programme of monthly meetings where many renowned historians and authors both locally and from further afield offer topics covering a wide range of interest in the Great War of 1914 -1918. 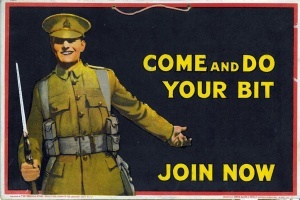 Wessex Branch endeavours to cover a broad spectrum of subjects across the main historical domains of land, sea and air and other not so well known aspects including the home front, war poets and the role of women in the Great War. The Branch does not restrict subject matter to the Western Front nor just to British Forces, attempting to cover the Central Powers and other nations across the domains stated above. All meetings are open to non WFA members. The branch supports the Keep (Dorset and Devonshire) Military Museum as an organisational member of its ‘Friends’. We maintain links with the Wardrobe (Berkshire and Wiltshire) Museum and the Royal Hampshire Regiment Museum. Wessex Branch WFA tries to arrange at least one field trip per annum to a suitable UK venue such as the IWM, RAF Museum et al. We also plan at least one battlefield tour per annum to France, Flanders or other battlefields of the Great War. All tours and trips are priced at cost and subject to demand. Travel Insurance is arranged by individual travelers at their own expense. For schedule of meetings and other events and location directions of PVH click here and follow links. Membership of the WFA is at national level but it is not a condition to attend our 11 branch meetings per year or benefit from other branch activities. There is no fee involved to become a branch member although everyone attending a branch meeting is invited to make a small donation. We hope that visitors to the branch will consider joining the national WFA to benefit from the excellent, high-quality publications and to enjoy the other advantages of membership.